Porsche 964 – A timeless classic. Most of us have been in situations where a small car with two bulging headlights, a slanted rear end and a thunderous roar have passed us on the highway, leaving us hoping we were in that car . In fact, I have experienced this particular incident pretty much all around the world – twice on a California highway overseeing the Pacific, once at a German Autobahn where I myself was driving around 105 mph in an Audi A8, and most recently on a dusty Dubai motorway where I was co-piloting a Corvette. 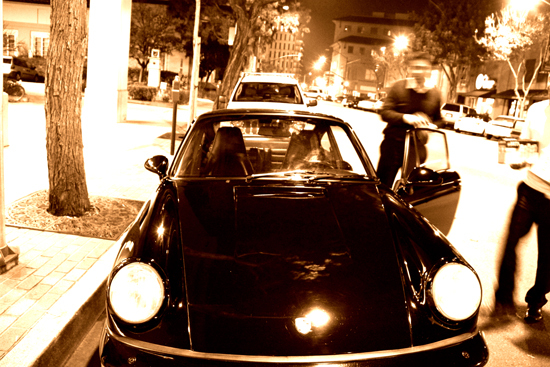 All three times, my companion commented something to the effect “that’s a 911” – as correct as they were in their identification of the car, the devil is truly in the details – all three times the car was a Porsche 964 – see it’s not enough to call it just a 911. The world should know the difference between a 964, 993 and for heaven’s sake a 997. Porsche 964 is a timeless classic which was born in Stuttgart, Germany in 1986 and approximately 67,000 were manufactured and sold between 1989 and 1993. Arguably it is the most sought out air-cooled Porsche in the world as it provides a perfect balance of style, technology, raw power, comfort and it won’t break the bank in acquiring one. However, acquiring a Porsche 993 will not only break the bank – at least my bank, it will also make the wife un-happy (maybe even make her go on a shopping spree in retaliation) and steal from the kids college funds – all the necessary evil, people need to keep an eye on while watching the road as they cruise in their 964. In my world, 993 is not worth spending another $15-$25K, when the exhilaration in driving a 964 is the same as a 993. Porsche 964 is one of the few cars in which you can feel very comfortable driving through an African safari and then to a dinner date on the same day. It certainly holds its own on both occasions. While the critiques may categorize these statements as clichés, the fact that “Singer Vehicle Design” an outfit which takes “best of breed” parts of various Porsches and retrofits them to create a $500K beast, uses Porsche 964’s chassis as their main building block, says it all. When searching for a 964, a few things should be kept in mind as this car is available with various options that include: 4 wheel transmission – where the back wheels have majority of the power, Turbo – which goes for a premium and is harder to find, RS – very rare model and absolutely worth the additional premium it demands. No matter what you end up finding and hopefully buying, you will enjoy this car when you drive it. The key word in the previous sentence is “drive” – as this car is made to be driven. I know people who have their 964s parked in the garage for extended lengths of time. Every time, I see their 964, it reminds me of an Arabian Stallion who is not allowed to run. It is stealing from the very instinct and principle this car was developed on. The exterior of these cars has hardly changed over the years, talks a great deal about the aerodynamics of the car and customer satisfaction from the design. Little is known about the spacious interior of this classic. While critiques point out the smaller back seats, they fail to notice that the front seats easily accommodate tall individuals better than any other car in its class. A true classic, a complete package, style with core power – Porsche 964 is a must have. Porsche 964, get one and redefine freedom. Porsche 964 is a mindset and not a transportation utility. Until you have – enjoy the hunt of getting one!